Kill the ducks. Put them in a pot and pour boiling water over them. Remove feathers by hand as much as possible. Pliers may be necessary for those on the wings. 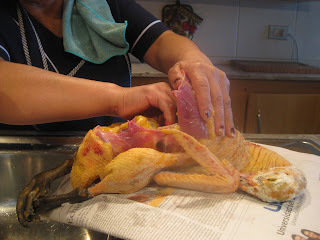 Cut off the beaks and pull out all the innards and tongue through the cavity between the breast and tail. 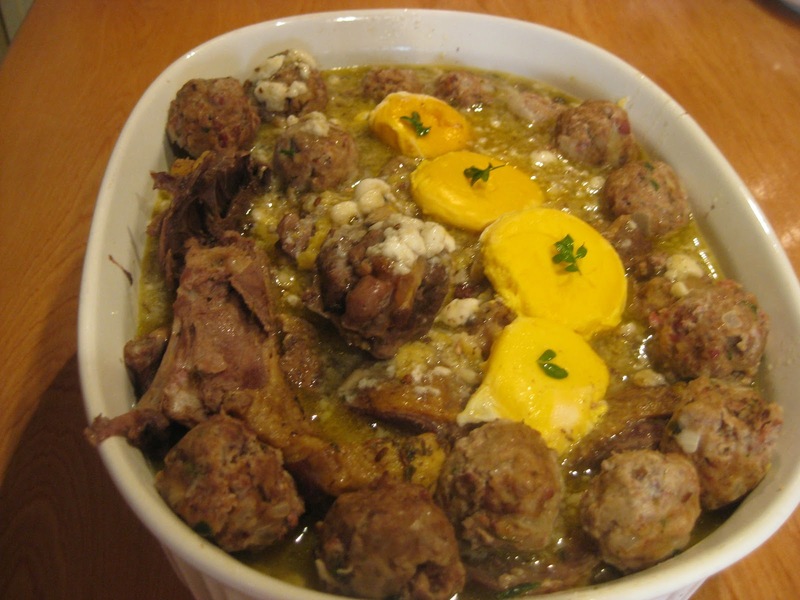 Wash the innards and save the gizzards, livers and other parts used in broths and gravies. Tie the claws of each bird together and hang them by their feet over night. Joint the birds. Wash them and put them in a pot with the other ingredients and cover with water. Bring to a boil and simmer for about 1 hour or half hour is using a pressure cooker. Remove the meat from the pot and put it in a large serving bowl. Chop the onion. Mash the garlic. Gently sauté in olive oil until the onion is translucent. Remove and set aside. Clean the gizzards and soak them in water with vinegar for 1 hr. Mince them. Put them in bowl with the onion, garlic, murri, chopped herbs, pepper and onion. Add 1 egg slightly beaten. 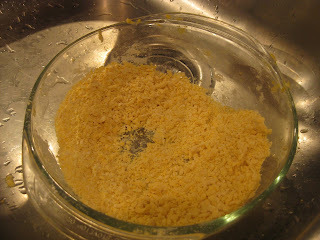 Mix with breadcrumbs and refrigerate until ready to cook. Mix one slightly beaten egg with 1/2 c flour to make crumbs. Beat vigorously until crummy. Add the crumbs to the broth beating it vigorously with a ladle to prevent large clumps from forming. Put the rest of the flour in a soup bowl and roll the meatballs in it. Then add the meatballs to the broth. When cooked, remove the meatballs and set aside. Separate the white and yolks of 4 eggs. Beat the egg whites into peaks and add them to the broth to make tiny snowballs. Pouch the yolks in a small fry pan with a little water. Pour the broth from the pot over the ducks then decorate the dish with meatballs and egg yolks. Add a few sprigs of rue for color. And serve if it pleases God! Perry translates cerceta as a wigeon, both he and Huici translate that this is also known as a “sparrow hawk.” The Scientific name for wigeon is Anas Penelope and that of the sparrow hawk is Accipiter nisus. 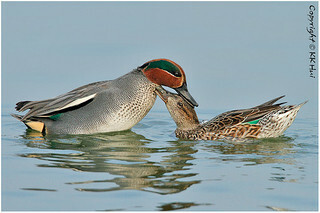 Wigeon is from the Anas family, the same as the teal, This makes it is plausible that the former be used in this recipe. Further, less wigeons are required to feed 4 people as they measure 19-20“ in length and weigh 1 ¼ -1 ¾ lbs. Wigeons are in between mallards and teal in size. If serving teal 2 would be required per person. As neither widgeons nor teal were available at the time of making this recipe, one mallard was used instead. 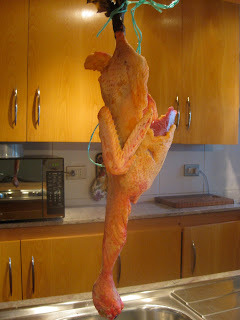 See blog titled al-morí published on August 25, 2011 for recipe. Corta la cerceta por todas las articulaciones en dos y ponla en una olla; se toman las mollejas de las gallinas y de la cerceta y se limpia y corta lo más aplastado que se pueda; se echa en la olla con una cucharada de almorí, una cabeza de ajo y dos cucharadas de aceite dulce, un tallo de ruda, otro de tomillo, pimienta, alcaravea, cilantro seco y verde, un poco de cebolla y la clara de cuatro huevos, se bate bien batido y se echa una cucharada de ello en la olla y con el resto se hacen albóndigas y se parta algo de ello para la levadura; se cuecen las albóndigas en la olla y se remueve la olla por sus lado suavemente hasta que se iguale su grasa; entonces se toma la clara de cuatro huevos y se bate con el resto del relleno, migas de harina cernida y algo de pimienta; se espesa con ello la olla y tú habrás cocido las yemas de los huevos antes de esto, luego se vierte en la fuente y se adorna con las albóndigas y las yemas y se presenta, si Dios quiere.